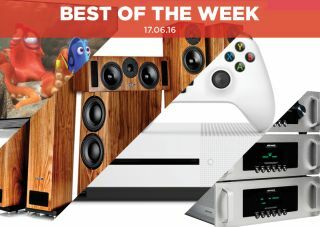 Best of the Week: Xbox One S console, LG OLED65E6V 4K TV, PMC Twenty 23 5.1 and more | What Hi-Fi? A round-up of stories to have featured in What Hi-Fi? this week, including news of a new Xbox One S console and reviews of an LG 4K OLED and a PMC surround sound package. This week we got wind of a new 'Blak' premium range of hi-fi products from Roksan, Audio Research announced its "more affordable" Foundation line of hi-fi standalone kit and Microsoft revealed the slimmer, 4K focused Xbox One S console. We had reviews of Arcam's Solo Music one-box system, LG's OLED65E6V TV and PMC's Twenty 23 5.1 surround package. Roksan has introduced the Blak series, a premium range of standalone hi-fi products. The range consists of the Blak integrated amp and CD player. The former comes with aptX Bluetooth, RCA and XLR inputs, while the latter features optical, coaxial and XLR digital inputs. Roksan says that the range could expand "over time" to include more products. The integrated amp will sell for £2750 and the CD player for £2500. Audio Research has introduced its "more affordable" Foundation series. The series is made up the LS28 preamp, PH9 phono stage and DAC9 digital-to-analogue converter. They'll be available in the UK from June, July and August respectively for a not inexpensive £6998 each. All three models will be available in black or anodized aluminium finishes and come with a custom-made metal control. At this year's E3 gaming conference, Microsoft took the stage to unveil the Xbox One S.
It's 40 per cent smaller than the original, with 4K output, an Ultra HD Blu-ray player and HDR support. There will be three different versions when it goes on sale in August with 500GB; 1TB and 2TB options priced at £249, £300 and £349 respectively. "The Arcam Solo Music is indeed a complete one-box stereo system"
When we tested the original Arcam Solo in 2005, we thought it was the "benchmark system at this price level". Ten years later and we feel the same with this third-generation version. It's a versatile machine that can play CDs and SACDs, stream from a network, has DAB/DAB+/FM tuners and is fitted with HDMI, optical, coaxial, USB, phono and 3.5mm connections. What about the sound? It's powerful and smooth - the Solo is clear, balanced and detailed. For a one-box stereo system this is an excellent choice. "From aesthetics to sound quality to picture performance, the OLED65E6V is a TV fit for kings"
LG's upturn in form has seen it turn out some cracking TVs of late and there might be none finer than its OLED65E6V. LG is fully behind OLED and it shows in this stunning picture performance. Sharp, crisp and immediately eye grabbing, it is a remarkable viewing experience. It doesn't skimp on other features with the WebOS interface as slick as it's ever been, and its soundbar stand is an improvement over standard flat screens. Whichever way you look at this TV, it offers a fantastic performance. "We’ve had the PMC playing for a month as our reference speaker package, it's still filling out and improving bit by bit"
We've long been fans of PMC's excellent Twenty 23 floorstanders, so we thought why not build a surround package around them? Turns out, it's so good we decided to use it as our reference system. It's a package that has many talents, whether it's the insightful, precise sound or the stunning integration of the speakers into one, coherent whole. It just gets better and better with each listen. The £8240 price tag puts it out f the range of many, but we can't speak highly enough about it. It delivers an incredible surround-sound experience.